Do you want a beautiful, practical, environmentally responsive home at a fair price? You can ensure your family’s comfort by making your home less dependent on traditional energy sources. A new or remodeled home utilizing passive solar design can save more than 80% off your heating and cooling bills. This is a better return than traditional investments. Plus, solar homes can be quite beautiful and are much better for your health and our environment. Whether you just want to remodel your current home or build a whole new EcoHome*, the internationally experienced, award winning, ecologically conscious firm, Doerr Architecture, can help you realize your dream. Your home can be off the utility grid and even produce more energy than it uses, a net-zero energy home. 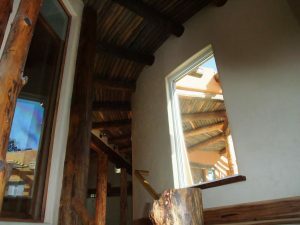 *EcoHome (ê´kô hôm), n. a home that is both ecologically responsive and economical. An EcoHome is healthier for you, your family, and the planet because it does not waste resources, off-gas toxins, or unnecessarily harm the environment. An EcoHome will save money on your energy and healthcare bills long into the future. The green expertise of Doerr Architecture’s principal, Thomas Doerr, was honed as past chair of the Colorado chapter of the American Institute of Architects (AIA) Committee on the Environment. He authored the Green Architecture Checklist for Residences and edited the Green Architecture Checklist for Commercial Buildings. He was an assistant editor of the Rocky Mountain edition of The Sustainable Design Resource Guide. Thomas also passed an exam to be a Certified Green Points Architect. For several years Thomas has been teaching professionals and the general public about passive solar design, he created an instructional video Passive Solar Simplified, and he is now finishing his book with the same title. Thomas keeps apprised of the latest developments by regularly attending conferences such as the Congress of New Urbanism (CNU) and Leadership in Energy & Environmental Design (LEED). With this expertise, Thomas can design your home so that it is healthier for you, your family, and the planet. Even if you were not concerned about the environment, it would be smart to design ecologically because green design saves you money. "Thomas' professional experience and talent made my project successful both aesthetically and economically."